Surviving Sharks are an important staple of the Adelaide music scene with a healthy following and an impressive list of local collaborations and support slots. Following EP releases, a music video and string of regular live performances, their debut album is a welcome addition to our musical landscape. Oculus Magnus is loud, riff-laden rock’n’roll, a recording that effectively captures the trio’s honest, hard-working ethos. Tight guitar licks, driving bass and vocal harmonies make for a consistent and satisfying listen. Mining a grunge vein that mixes in an Aussie pub rock aesthetic, the Sharks never stray too far from the script; and this is their strength: there’s no pretension here, the band understand exactly what they do and they execute it well. The song-writing is reliably tight: most of the tracks run to around the three minute mark, with plenty of musical hooks packed in. ‘Dreams’ opens the album with some laidback blues, but just as we are tempted to settle in, the 90s grunge groove of the chorus rips us into another place altogether, setting the tone for the rest of the recording. The change up here works nicely. ‘Snow’ then follows this up with some fat riffs over an engaging shuffle. ‘Crystal Ball’ is an economical piece of song construction, fast paced and appealing, while the slight dip in tempo on ‘Fire’ provides for some pleasing interplay between guitar and bass. With its searching, penetrating rhythm, ‘Have a Go’ is a layered track that builds to the suitably caustic chorus of “You desecrate what you can’t control”; a highlight of the LP. ‘Day Into Night’ is built over a classic 90s grunge sound, while the syncopation of ‘Russian Tide’ makes for a frenetic track with great energy. The catchy ‘Bleed and See’, the focus of the band’s first video clip, rounds out the album. There’s an urgency about Oculus Magnus and you’re at the end before you know it. While there is some material that has appeared on previous EP releases, it all works well when packaged up together on an album and it gives these songs the opportunity to reach the wider audience they deserve. Settle in with a beer and put the volume right up. 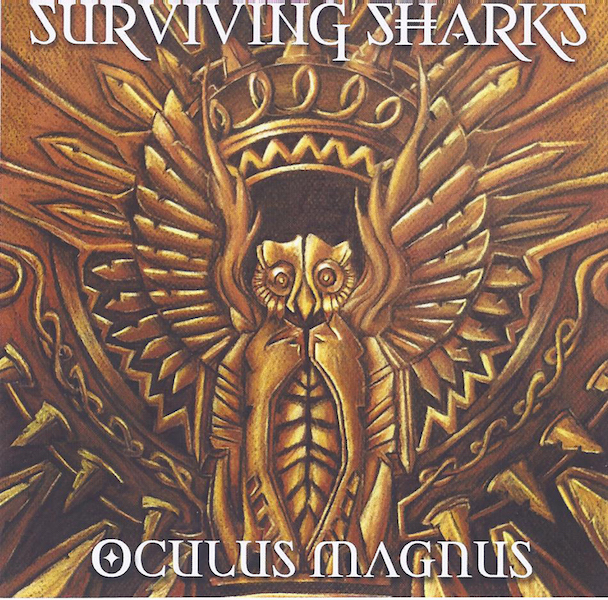 Posted in Music, Reviews and tagged Adelaide, album, oculus magnus, Review, Surviving Sharks. Bookmark the permalink.